WowWee, a leading manufacturer of hi-tech consumer robotic and entertainment products and makers of Fingerlings™, today announced the launch of UNTAMED™ ARena, the new augmented reality app for mobile devices that is fully integrated with the entire product experience and transforms any living room, park, playground - you name it! - into your UNTAMED creature's modern-day arena. 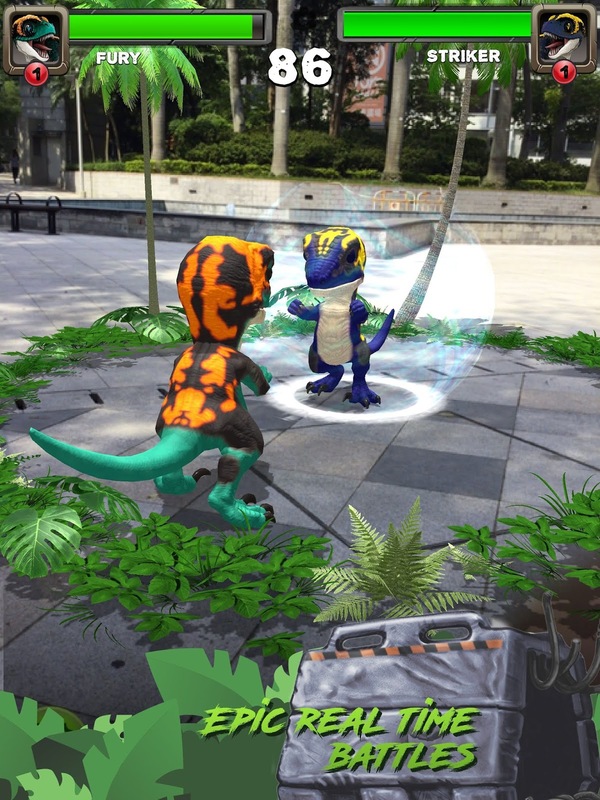 Built by HappyGiant, one of the leaders in Augmented Reality Games and Experiences, UNTAMED ARena provides a complete AR experience equipped with 3D toy recognition that allows players to experience their toy in a whole new way and fully immerse themselves in the game. The App supports all UNTAMED Raptors and T-Rex toys, and is available for free on iOS devices here, coming soon to Android. Kids looking to throw down with their UNTAMED companions will now have the added opportunity to scan their real-life creature using their mobile device and unleash it in an augmented reality world. As they watch their toy transform into a 3D animated replica, they'll be able to challenge friends and anonymous foes to battles in real time. Using a technique HappyGiant has developed called "Full Body AR", the game reacts to players' movements so they can dodge, jump, squat, and move around for a fun, physically active experience. Kids can also scale down to tabletop play, where they can pet their creature, play fetch, feed them, and even calm them down or rile them up using direct taps and swipes. "It's so exciting to see UNTAMED as an entity grow beyond the world of toys and enter the app space," said Andrew Yanofsky, WowWee Brand Manager. "In today's 360 entertainment world, it's important to cover every vertical that's dear to your audience. The app space was a natural extension for us, and we're proud to have done so in such an innovative way." The more kids play, the more they'll unlock unique combat abilities, rewards, and game features to achieve the ultimate objective of becoming a Master Creature Tamer. A Master Creature Tamer will have unlocked all UNTAMED characters, all special abilities, all food items, and the entire Creature Customization tool. With its built-in Leaderboard, players can see how they rank against others in the UNTAMED ARena at any time. "There's a ton of AR tech, but UNTAMED ARena really stands out as a full-fledged AR Battle platform that's unlocked by the purchase, enhanced by the toy, and maintains the core brand promises of the UNTAMED line," said Davin Sufer, Chief Technology Officer at WowWee. "By working with HappyGiant, we created a cutting-edge AR app with really great detection and tracking, and we plan to keep innovating and pushing the bar with the latest and greatest AR features that are available." For more information, visit https://untamed.wowwee.com/.